Until 1867, the Hudson's Bay Company controlled most of the area of modern Canada west of Ontario. A flag much used in this territory was the British Red Ensign (a red flag with the Union Flag on the canton) with the capital letters H B C in white on the fly: the letters H and B are joined together in a monogram arrangement. One of these flags is displayed in Christ Church Cathedral, in Victoria, British Columbia. This flag was probably the prototype for the Canadian Red Ensign and several provincial flags. The 329-year-old department store which sprung out of the HBC has its own flag, but it's nothing like what was posted, but is instead (you guessed it), something like a coat of arms on a bed-sheet (nice heraldic coat of arms on a plain white field - rare to see department stores here having heraldic arms, but since the store was founded in 1670. A Hudson Bay Company flag measuring approx. 11 feet 9 inches by 5 feet 2 inches was posted for sale on Ebay. It features a sewn design, made of what looks to be a strong linen. It was manufactured by John Leckie Limited out of Toronto. It shows obvious signs of being well flown, as it was patched in the far right corners, which tore again at sometime. The flag originated in Winnipeg. There are a couple of possibilities for flying a flag of this size from this time period. It's possible that The Bay flew it, as it opened in 1926. It's also worth pointing out that in 1920 the Hudson Bay Company celebrated its 250 year anniversary and HBC Red Ensigns were again flown at Upper and Lower Fort Garry. Meantime, canoes and "York boats" are constantly arriving from the post, the steamer having been expected. 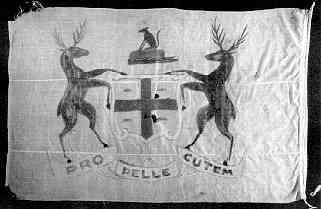 One of the latter, bearing a great white flag with the arms and motto (pro pelle cutem) of the Hudson's Bay Company, brings the factor in charge of the district. The flag illustrates English heraldry which flourished in the 14th and 15th centuries. When Charles II granted the Hudson's Bay Company charter to his cousin Prince Rupert and 17 gentlemen in 1670, he asked that whenever the king visited the H.B.C. area, Prince Rupert should receive as a tribute the furs of one fox, two elk and four beavers. These seven animals make up the heraldic design. Under the shield with its red cross of St. George is the gold-lettered motto "Pro Pelle Cutem" meaning "fair value in exchange for pelts." The H.B.C. began using such a flag in 1767 both on its ships and its forts. The date is given as 19th Century, image courtesy of the National Maritime Museum.